Do you ever feel like you’re held back from your dreams by financial constraints? We have the perfect solution for you! PosterMyWall gives you the opportunity to create and sell designs online. It’s a simple yet effective way of earning from home. You don’t even need to have any prior design expertise or skills to become a designer on PosterMyWall! You can sign up on PosterMyWall for free. 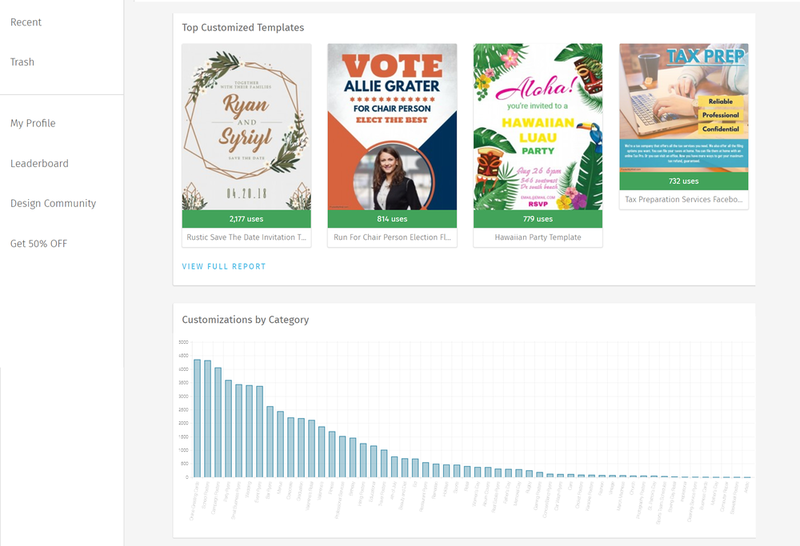 Once you’ve signed up, you get unlimited access to our editor, tools and millions of stock resources which help you create customizable posters, flyers, videos and social media graphics within minutes. Sign up as a designer on PosterMyWall in a few simple steps. Visit PosterMyWall and proceed to 'Create a Design'. Browse through our existing templates to get inspiration for your designs. Once you’ve created your design, follow these simple steps to submit your first template and becoming a designer on PosterMyWall. Navigate to the 'File' option on the upper panel of your builder. Click 'Submit as a Template'. Choose the option of 'Create a New Account'. Enter your details and 'Sign Up'. 1. Enter all relevant details about your design template. Name of the template: A simple phrase that adequately describes your template. It should ideally describe the outlook, theme and design type of your template. Let’s take the example of this Concert Flyer, for instance. A suitable Name for this template would be “Blue Concert Invitation Flyer Template”. Relevant tags: These are keywords people type in search boxes when looking for a template. Make sure you enter the keywords that relate to your template the greatest. Tags you could include for this Concert Flyer include: “Concert Flyer, Music Flyer, Band Poster, Gig Poster”. Repeating a keyword in these tags will not help, so keep repetition in tags to a minimum. Category of the template: Choose the category your design falls under, from one of our pre-existing categories. If there is no exact match, select the category that is closest to your requirement. The Category for this template would be 'Concert/Band Flyers'. 2. Enter your PayPal and Mailing Address Details. Proceed to 'Setting up Royalty Payments' where you’ll enter your name and PayPal address. The next step is to enter the details of your 'Mailing Address' so we can contact you, if need be. U.S. residents are required to provide Social Security numbers for royalty payments. 3. After filling in all the details, click the option of 'Submit Design Template'. Your design is now added to the PosterMyWall Templates gallery. You will now be able to see the number of times your design is customized and purchased. For a quick walk through of the above mentioned steps, you can also check out our Step by Step Guide on Publishing your First Template on PosterMyWall. Now, that you have joined our designer community, let’s look at how you can earn with your templates! Once you have submitted your design on PosterMyWall, every time someone purchases your design, you earn royalties. You get a 35% royalty on downloads and a 10% royalty on prints. Royalties are transferred on a monthly basis via PayPal. This shows all the categories that will be popular in the next few months. This includes categories that are popular with the users but lack content. Making templates for these categories increases the probability of your templates getting used. This shows you which of your designs have been customized the most, giving you a greater insight about user preferences. You can also see the breakdown of these customizations by category through the 'Customizations by Category' chart. This shows you your top ranking designs, in terms of sales. You can see the additional breakdown of your sales through the 'Purchases by Category' chart. Moreover, you can also check which of your templates have been customized by navigating to the ‘Activity Log’ on the left panel. We hope this guide taught you all you need to know about selling designs online through PosterMyWall. If you have any questions, suggestions or comments, please reach out to us here. We’d love to help you out!